I'm experimenting with two new features on the kiskeácity site that I'd like you to know about. The first is the "Recently read/seen/heard" section in the right hand column. This section contains items that I have recently come across on the web and find interesting. Most have to do with the current US election. The second is the "Not just (bad) Haiti news" section, also in the right hand column. 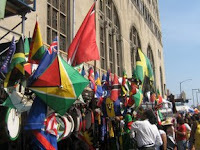 It generally contains items I found on the web relating to the Caribbean. Neither section will be included in the site's RSS feed/email subscription so I encourage you to check it out on the site. They should both update pretty regularly as I bookmark items for them while surfing the web. The Préval/Alexis government, upon its arrival in power in 2006, pledged to address two major challenges: insecurity and the high cost of living. In terms of insecurity, even if a lot remains to be done, one need not exaggerate to say that the government has produced numerous efforts toward bringing calm to areas of risk-those completely controlled by armed gangs, most notably Cité Soleil, Bel'Air, Grand-Ravine, Martissant, Gonaives, etc. Several gang leaders have been arrested. Numerous kidnappers have been judged and convicted over the course of the 2006 and 2007 criminal trials. This has fostered a climate of calm, and activities that were previously paralyzed have been able to restart. However, no effort has been made to improve the population's socioeconomic conditions, particularly regarding food. In the space of two years, the Haitian population has witnessed a phenomenal rise in the price of basic necessities making the right to food, one aspect of the right to life, a violated right. An eruption of the situation was to be expected. Put to sleep by Angela Davis. Sort of. 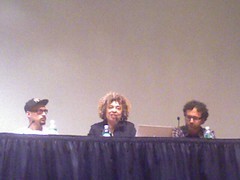 Graffiti artist Alan Ket, Angela Davis and moderator. But two of Davis' (younger) co-panelists saved the day. The first is Hank Willis Thomas whose work uses the aesthetics and certain themes of advertising to make very non-commercial points. 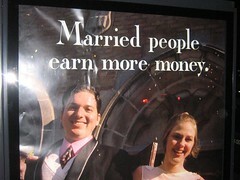 He is interested in how advertising manipulates perceptions of reality. 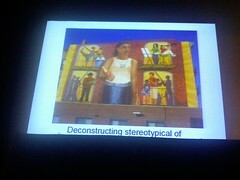 And then there was Amy Sananman, founder and Executive Director of the Groundswell Community Mural Project. Sananman conceived of the project in 1996 with the mission to bring together professional artists, grassroots organizations and communities to create high quality murals in under-represented neighborhoods. Dread Scott is known for his controversial use of the American flag in art he hopes "propels history forward". Alan Ket has ben painting graffiti on the New York subway since he was a teenager growing up in Brooklyn. I took pictures of the various co-panelists's slides which might tell you more about what they had to say. 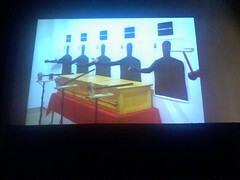 The irony of it all is that Ms. Davis spoke last, as if to provide context to what the artists were showing. I sat through great presentations expecting she'd be the icing on the cake only to find out this panel was not saving the best for last. 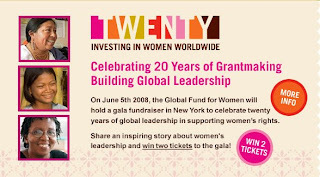 The Global Fund for Women is raffling off two tickets to their gala fundraiser in New York City on June 5th. Ellen Johnson Sirleaf, the Honorable President of Liberia, as well as women leaders from Colombia, South Africa, Malaysia, Liberia, Bosnia/Herzogovina and Egypt will be honored at the event. The coolest part is that to enter the raffle you have to submit a 200-word story about a woman, or women, who you consider to be leaders. They are highlighting some of the stories that they receive on their web site. The deadline to submit your story is May 1st. It's the Aimé Césaire edition. Georgia Popplewell who is Trinidad-based has a special connection to Martinique because she lived there for a bit. Very soothing to the ear. Georgia knows how to select her music clips. Georgia is the current Managing Editor of Global Voices and Caribbean Free Radio is her own blog and podcast. Aimé Césaire is the legendary Martiniquan poet, statesman and philosopher who passed away last week. A national icon for Martiniquans. Languichatte, the late Haitian comedian and father of Lolo and Daniel Beaubrun of Boukman Eksperyans. 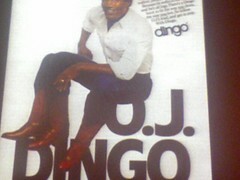 See the Facebook page dedicated to him, complete with the Haitian TV show's theme song! A treat full of memories of Friday evening laughter. 1,037 nostalgic fans have joined it. I found this joke and this slideshow on youtube. They're in Creole and hopefully someone can translate some to English on DotSUB. Aimé Césaire, the late Martiniquan poet and politician. 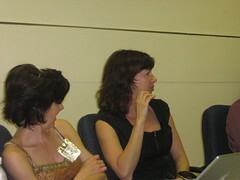 Memories of bloggers from the world over are summarized on this blog post by Jen Bréa at Global Voices. Césaire was one of the theoreticians of the Negritude movement. He passed away last week. He penned La Tragédie du Roi Christophe, a play about an early Haitian statesman. I had the pleasure of doing just that twice in the past two weeks, on behalf of Brooklyn for Barack and New York for Obama. First at Bushwick School for Social Justice's Social Justice Day, I showed students this film about the impact of Barack's message on fellow high school students in the Bronx. Then last wednesday, I was at the Jewish Community Center on the Upper East Side debating Stephanie Hauser, the Secretary of Young Democrats of America, who was representing Hillary. 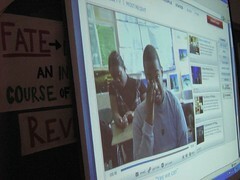 In both cases, students were eager to find out whether I'd actually met Barack. 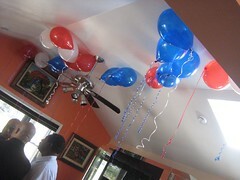 But they also enjoyed seeing pictures of getting out the vote, voter registration and election day. Update: Here is the video's link for those reading through feeds. Update (4/21/08): I had the link wrong. Here it is. The one above is the link to the actual speech. kiskeácity is now on Facebook! Please join the kiskeácity group on Facebook. If you are not yet a Facebook member, you may want to consider getting an account. It's been a valuable networking resource for me. Also, invite me as a friend and add the note kiskeácity so I know who you are. As I've been busy with innumerable projects in the past year, it's been hard for me to post as often as I'd like but Facebook will allow even more ways to interact. See you there! 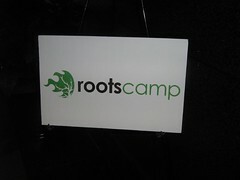 I was technically at Rootscamp because of my interest in political campaigning so I registered as being part of Brooklyn for Barack but media came up a lot and I had as many conversations about media, web 2.0 and Global Voices as I did about the campaign trail. I was generally pleased to find that the dress code was very casual, which only surprised me because the event took place in DC. As un-conferences go, there were elements here that reminded me of Open Translation 2007 (organized by the creators of the genre, Aspiration tech). Like the agenda setting process. Both (un-)conferences featured spontaneous, on the spot agenda setting which considerably toned down the potential for top down stuffiness. 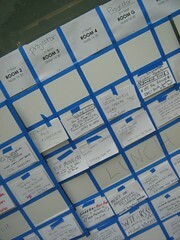 But Rootscamp's agenda setting and Rootscamp generally were much less collaborative and collective than Open Translation 2007. Open Translation 2007 did a much better job ice breaking and discouraging the banding together of people who already knew each other. OTT used inane quantities of alcohol to accomplish that goal and though Rootscamp offered mimosas at breakfast on day one, its evening party was ridiculously tame ... One of the pluses of the OTT approach is of course the bonding but it's also more emotionally taxing. 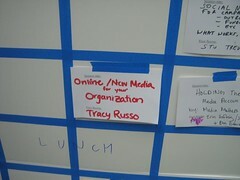 Tracy Russo, formerly of the Edwards campaign offered an online organizing session that turned out to be a hit and had to be repeated the next day. Among other interesting points, she expressed skepticism with the notion of blogging under one's own name on behalf of a campaign or organization. Specifically, campaign or organization blogging have to by definition be vetted and thus unspontaneous. I learned tons throughout the conference but one session held by two women from Mobileactive.org on cell phone organizing and fundraising stood out. The ladies of mobileactive.org (Katrin Verclas and Catherine Geanuracos, pictured above) talked about the high response rate on text organizing whether it be for GOTV or for fundraising. An astonishing 46% response rate was discussed which is much higher than the email response rate. 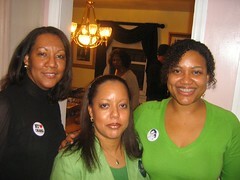 My sister Laurette, pictured in the middle below, and her friend Hilde (left below) helped organize it and I was asked to speak about my experiences volunteering for the campaign in Brooklyn, NY, Milwaukee, WI, Cleveland, OH and Philly, PA. 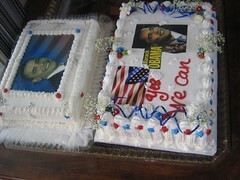 It was all very thrilling but most would agree that the Yes We Can cake was the highlight of the evening! Senator Weinberg who had attended a similar grassroots fundraiser the day before talked about the very first press conference she and Assemblyman Gordon held in support of Obama early in 2007 when few believed he had a chance. Less than 10 people showed up, she recalled. A student from New York traveled all the way to NJ to give a speech on Obama and a local real estate agent showed up to hand out free Obama T-Shirts. 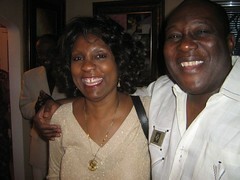 Most of the guests had been personally invited by the Josephs but some, like the couple from nearby Englewood pictured below, found out about it from www.barackobama.com. 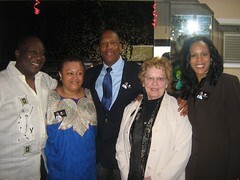 One of the guests claimed that Haitians in New York voted mostly for Barack's opponent because they were not sure back then (Feb 5th!) whether he could win. I have yet to get my hand on the stats but since I had made appearances to speak about Obama on Radio Tropikal while volunteering with Brooklyn for Barack, I was a bit disappointed. This is to be further investigated. Here is the slideshow. This view may be better if you want annotations of each picture.